Large one bedroom apartment for rent available June 1st, located downtown Revelstoke. Consists of three very spacious rooms ( kitchen, living room and bedroom) and a bathroom with tub and shower. 640 sq ft. 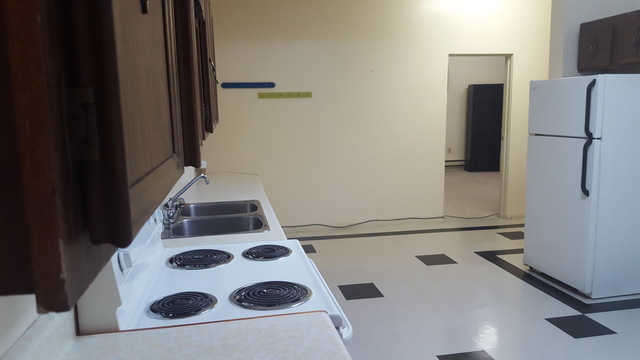 The apartment is unfurnished but comes equipped with a fridge and stove and a wall full of cupboards in the kitchen, and a full wall length, built in closet, in the bedroom. Rent $950 month includes heat, air conditioning, hot water, electricity and a security system. High speed commercial Internet available. Downtown on street parking. No pets, Non smoking. Suitable for a quiet single or couple. We are looking for long term tenants. References required.